DAPP Zimbabwe is pleased to release its 2017 Annual report , demonstrating the value of its work over the past year. The report includes an overview of projects and their activities , summary of major achievements, data on total projects delivered, partners worked with, people reached, case studies of particularly successful projects in 2017. DAPP Zimbabwe reached over 300,000 people in 8 districts across the country, through 14 development projects in the areas of education, community development, agriculture and health. DAPP’s work is contributing towards the Zimbabwean Government’s Sustainable Development efforts. development together with the most marginalised in the society. Imagine the beginning of the agricultural season, the farmers have prepared and planted after the first rains. But the rains fail to continue or are not sufficient. We are seeing this more often as the climate gets warmer resulting in less food being produced. Farmers are usually left with limited options. However DAPP Farmers clubs is in the forefront in offering farmers viable solutions to reduce the shocks. 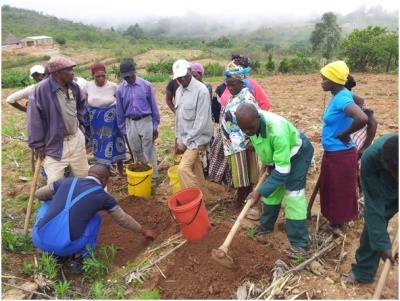 DAPP Farmers’ Club Zimbabwe in partnership with United Nations Environmental Programme (UNEP), work together with small scale farming communities of Gutu and Mutasa districts in Zimbabwe. Through a 2 year project which enrolled a total of 2000 farmers called “Sustainable Lifestyles and Education Programme”, farmers are trained on how they can prepare themselves against some of these shocks. So, what have small scale farmers been taught to reduce crop losses under difficult weather conditions? Soil that has a mixture of animal and plant matter and a lot of life is good in storing water and nutrients thus allowing maximum growth of crops and plants. Farmers were taught ways to build up soils such as covering the soil with mulching, crop rotation, adding compost manure, minimal soil disturbance as well as planting fast maturing crop varieties. Farmers enrolled in the Farmers’ Club project received training on water conservation and are encouraged to shift from conventional tilling, burning crop residue and cutting down trees. Commenting on the benefits from the program to date, farmer Ackson Manjowe in Mutasa said “mulching irikutibatsira kuchengetedza hunyoro mumakomba atinodyara zvinoita kuti mbeu dzedu dzive ne utano hwakanaka uye musanganiswa wemashizha nemanyowa watinoshandisa unopa chikafu kuzvirimwa” (mulching helps to keep plant moisture while the leaves and manure mixture provides the right nutrients for the plants). Feeding the soil thus helps farmers build rich soils and ultimately reduce the impact of dry spells. As climate change continues to threaten food security farmers in our project have adopted home grown solutions to mitigate the effects of some of these shocks. The farmers are encouraged to switch to small grains such as rapoko, root crops like cassava as well as early planting fast maturing varieties that guarantee food security in short rainy seasons. They are also encouraged and helped to set up nutrition gardens to produce vegetables that thrive under low cost irrigation. A total of 100 rope and washer pumps are currently being installed in Mutasa and 7 bush pumps in Gutu to irrigate the gardens and to provide safe water for drinking. Trees are vital for our environment as they reduce soil erosion and maintain the water cycle that bring us rain. They provide shade and food for our animals as well as wood. They are thus worth conserving and replacing. Our farmers, in their groups, mobilise each other to construct firewood saving stoves and rocket stoves so as to reduce wood consumption. They plant live fences to reduce the cutting down of indigenous trees for poles. All open spaces are utilized to make sure that we meet our target of planting 200 000 eucalyptus for woodlots, 40 000 fodder trees, 40 000 fruit trees and 100 live fences. One of the trees that farmers are planting is Leucaena that can be used for livestock feed as well as providing green manure. The DAPP Farmers’ Club approach encourages farmers to not only stick together but to also share knowledge and join hands in production and marketing. A club usually has 50 farmers who are divided into 5 groups of 10 called core groups who share information and train together. They work and learn in a common garden and a demo-field and go on to practice in their individual fields. During seed fairs they share crops that grow well under difficult conditions and learn from farmers around them. 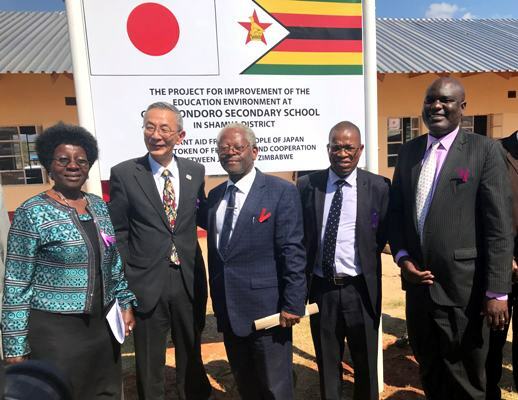 The facilities’ development was spearheaded by DAPP Zimbabwe through a $72,947 grant from the Government of Japan saw the completion one new classroom block and two teachers’ houses, refurbishment of an incomplete classroom block and ablution block. The school was also provided with desks and chairs for 121 students and four teachers. Speaking on the same occasion the ambassador of Japan to Zimbabwe H.E. Mr Toshiyuki Iwado, said that Japan attached great importance to basic education as a foundation for development. 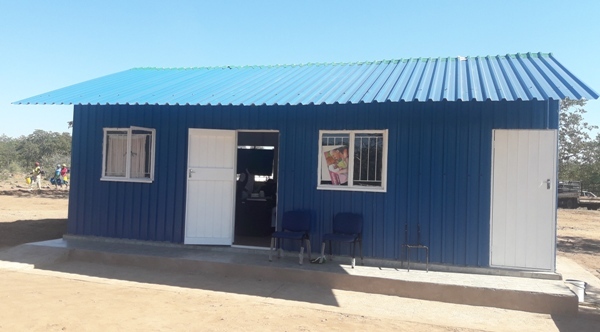 He hoped that, with the help of the improved facilities, the girls and boys of Chemhondoro would benefit more from their precious school years, and that those currently out of school would now attend school. He also praised the community, who had started to build one of the classroom blocks and the ablution block through their own efforts, and who contributed much time and effort to the project.